Nov 15 05 Become "friends" with Minibar: The band has joined the MySpace revolution and now you can hear an exclusive unreleased track, "Pets in Bed," co-written and performed with PJ Smith. While there, take a peek at some new photos too. We hear beards are in this season. 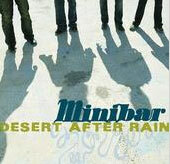 The rumors are true, Desert After Rain, Minibar's forthcoming CD is finally being mastered. Hear some of the new songs live as Minibar plays the Hotel Cafe on December 13th with Greg Johnson. Jul 24 05 Celebrate Malcolm's birthday (July 22) with this recent interview: Five Minutes With Malcolm Cross. If five minutes doesn't satisfy your Minibar thirst, read on for an update from the drummer himself. Hallo again to all 'Bar fans old and new; to everyone that came out to see us on the Pete Yorn Tour this month, thankyou! and hope y'all enjoyed the shows as much as we did. We tried to feature a bunch of songs from the new record - 'Things I Left Behind', 'The Sight of You', "Desert After Rain', 'Can I Call You a Cab? ', 'Wide Open' and 'Crime Scene Ribbon' were featured in setlists spread out over 5 dates. The ubertalented Joe Kennedy joined us for some fine keyboard accompaniment, and even Mr.Yorn joined us for some rocking drums on 'Retrospect' on the last show! Other mates we saw whilst out on the road were Brian and Alison Tighe (The Hangups, The Owls) and Marcel Galang (The Hangups, Heavy Sleeper) in Minneapolis and designers Brett and Heather Bolander (paver.us) in Columbus- Holla! In Detroit Si and I made time to visit the Motown Museum; highly, highly recommended for anyone who loves good music and a-crazy rags to riches story - Berry Gordy took the concept of 'home recording' to the next level! It's real nice to get away from L.A. once in a while and hopefully we'll be back to the Midwest soon (and with a new record...) Big love and props to all the PY crew who helped us out too; cheers lads. And to everyone else; check out the snaps and enjoy! May 28 05 Photographer Jessie Dasch submitted a stellar new batch of Concert Photos from the Viper Room starring Minibar, Gary Jules, Ben Peeler, and Sid's Beard. Rumor has it that summer will reward MinibarFans-in-waiting with a string of new tour dates. While the exact dates are still unconfirmed, Minibar is expected to join Pete Yorn on tour beginning in July. Stay tuned to Upcoming Dates as details unfold. In the "better late than never" category, Happy Birthday Simon Petty on May 16th! Two words: More Cowbell! Apr 17 05 Thanks to your support and contributions, the Minibar/Pete Yorn show at O'Brien's raised approximately $13,000 for tsunami relief aid. Stunning photos in the 2005 gallery celebrate your generosity. The lack of recent website updates certainly doesn't reflect a lack of Minibar activity. The band has spent much of this year in the studio to bring you record number three. Luckily for us, they're taking a break from recording to play the Viper Room on Wednesday. Upcoming Dates has (nearly sold out) ticket info. Jan 17 05 Stop by O'Brien's (2941 Main St, Santa Monica, 7 pm) this Wednesday for great music and a better cause: Minibar and Pete Yorn will be playing a Tsunami Relief Benefit organized by CHEERS. Bring your wallets and tip generously, as all cover charges and staff salary will be donated to disaster aid. Tim Walker will appear on television this week with Minnie Driver performing her new single, "Invisible Girl" on the following programs: The Tonight Show With Jay Leno on January 17th, The Late Late Show With Craig Ferguson on January 19th, and The Ellen DeGeneres Show on January 21st. Check your local listings for times and channels. Now on iTunes you can download Owsley's latest album The Hard Way, Simon co-wrote and contributed harmonica to the title track. In this Synthesis review, a journalist points out that the band prefers to "let the music speak for itself." Jan 07 05 While Minibar is joining forces with the multi-talented Evan Frankfort to create your next favorite record, we've been busy excavating the video archives. Head to the Video Gallery for super-fan contributions from SXSW's True Music special and 2003's KTLA performance. In reviews, Orcasound sounds off on Minibar's eclecticism, Uncut grants Fly Below the Radar a coveted four stars, and the band goes global with OnlyPunjab's write-up. Upcoming Dates is waiting to be re-stocked, but there's still reason to celebrate. Join Minibar & Co. at Renee's Courtyard Cafe in Santa Monica on Sunday night for Sid and Seth's mutually drunken birthday party. Can't wait? Party now with Sid's Birthday Crossword Puzzle.